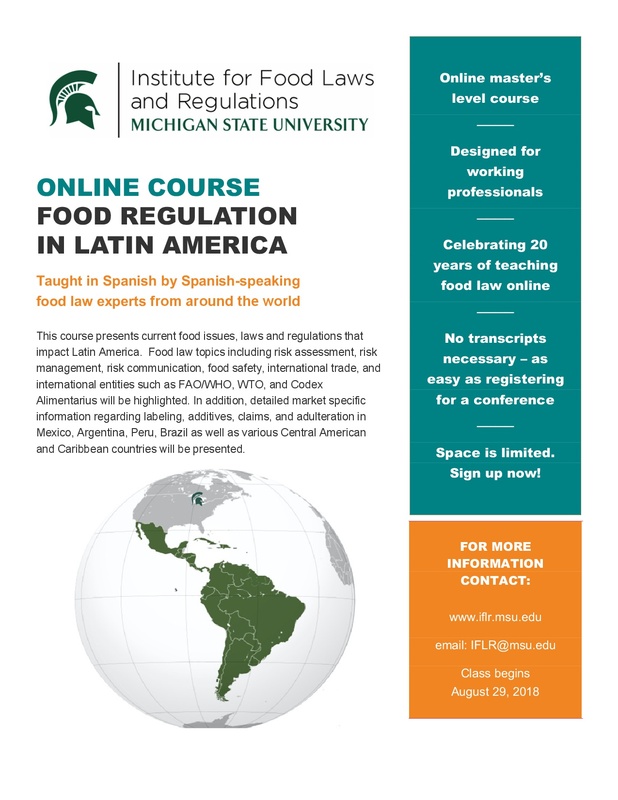 Michigan State University Food Regulation in Latin America course will be available online in Spanish and in English for Fall 2018 semester, starting on 29th August 2019. I joined the IFLR team as guest instructor and I will lead 2 modules of the program on WTO and international standards. I am most honored and deeply grateful to Neal Fortin and Kris DeAngelo for giving me this great opportunity. Brand-new course is perfect for students throughout the world who either prefer Spanish or who were previously unable to take our course due to the language barrier. This course is designed also for working professionals and presents current food issues, laws and regulations that impact Latin America. Food law topics including risk assessment, risk management, risk communication, food safety, international trade, and international entities such as FAO/WHO, WTO, and Codex Alimentarius will be highlighted. In addition, detailed market specific information regarding labeling, additives, claims, and adulteration in Mexico, Argentina, Peru, Brazil as well as various Central American and Caribbean countries will be presented. We are now completing the rosters and for the earliest subscribers to the Spanish taught version will be available a discount on tuition fees, mentioning that you are Food Law Latest readers. Write to IFLR@msu.edu for details on the program and tuition fees. The following article, beside examining EFSA report, will offer many insightful hints about how to build an effective crisis management strategy. Understand and anticipate consumer’s reaction is indeed the key. It will highlight also the ambivalent relationships that most of the consumers have with science and technology, when they mix up with food. Emerging risks are defined by EFSA as risks “resulting from a newly identified hazard to which a significant exposure may occur or from an unexpected new or increased significant exposure and/or susceptibility to a known hazard” (EFSA, 2007). Emerging risks in the food chain are characterised by high levels of uncertainty and ambiguity: this potentially makes more difficult to communicate about emerging risks than about “established” and well understood risks. The lack of appropriate risk’s communications can leave a vacuum that is filled by media speculation or rogue scientific analysis, therefore communication about emerging risks can help prevent the amplification or attenuation of risk perceptions. This pushed EFSA to investigate consumer knowledge and concerns about food emerging risks, as well as consumer needs and preferences with regard to emerging risk communication. The aim of the study was to better understand the views of EU consumers related emerging risks, so as to inform future communication activities around emerging risks at EFSA and Member State National Competent Authorities. nanoparticles (whose use in the food chain may have significant benefits for food but at the same time may have toxic effects on consumers). These three examples illustrated emerging risk respectively resulting from: new food consumption trends, food fraud and new technologies. The study delivered that there were differences between types of emerging risks, and between attitudes to emerging risks in EU Member States. Those differences correlated often – but not always – with, and were partly explained by reference to, variables that also contribute to attitudes to established risks: the perceived level of control over the risk, its natural/man-made character, familiarity with the risk, and public trust. They were also correlated to educational and generational factors. However, the study did not indicate that emerging risks triggered significantly greater levels of concern than established risks. Rather the study found that consumers tended to be more concerned about established risks than emerging risks. Food fraud, which arguably may include both established and emerging risks, was of greater concern to consumers than other types of emerging risks. Overall, consumers considered green smoothies less risky than nanoparticles, and nanoparticles less risky than plastic rice. Negative attitudes towards new food technologies may be linked with the perception that scientific advancements benefit the food industry, rather than consumers. This view is, however, contradicted by responses to other elements of the questionnaire that addressed the benefits of science and technology in food, where 78% of the sample agreed that scientific discoveries can help address some food issues. The study delivered strong evidence of how malleable perceptions of emerging risks are, something which sets them apart from established risks. Indeed, communicating information to consumers about both the nature of emerging risks and the uncertainty surrounding them appeared to have a significant impact on risk perceptions, specially in a context where a very large proportion of the respondents appeared to lack knowledge of the risks discussed. Overall, the most common impact was an amplification of risk perception, although there were also instances of attenuated risk perception. In the case of green smoothies, information about risk and uncertainty led a large number of consumers to revise their risk perception levels upwards. Perceptions changed also for both plastic rice and nanoparticles, although to a lesser extent. These impacts suggest that communications about emerging risks may entail beneficial changes to consumer awareness, especially in situations where precaution may be advised. If on one hand the study documented a lack of knowledge about the emerging risks used in the survey, on the other it also documented an overwhelming appetite for information about emerging risks, irrespective of the extent of the uncertainty. In general, consumers across the EU indicated that they would like to be informed of emerging risks earlier rather than later, in spite of uncertainties. Besides, consumers indicated that they were generally interested in obtaining not only general information but also information that could help them in making decisions about the risk, such as how to avoid it and how it affects them. Traditional media and the websites of national authorities were the preferred channels of information on emerging risks, while the sources of information that consumers had most confidence in were evaluators (health professionals and scientists) followed by watchdogs (consumer organizations and food safety authorities). The question arises as to how EFSA and National Competent Authorities in Member States can and should respond to these findings. While the citizens and cultures of the EU are highly diverse, it is advised that organisations responsible for assessing emerging risks and managing both uncertainty and risk should provide a unified and consistent set of messages. This would avoid the risk that different messages may be translated and compared, leading to confusion and distrust. To reassure consumers in Member States and countries to which the EU exports food and beverage products, EFSA should communicate in a unified and consistent manner both what is known and what is uncertain about the possible existence of, and potential significance of, emerging risks. Moreover, given that emerging risks are intrinsically uncertain, EFSA and National Competent Authorities should be clear about the existence of uncertainties. In relation to this particular feature, the literature recommends that information about “those uncertainties that really matter to the magnitude of the risk and its management” is communicated to the public (Kasperson 2014: 1236). While new information should translate into updated messages as time goes on, consumers could also contribute to risk assessment if risk communicators were to enrol them in the process; for instance, consumers can contribute information on their exposure to the risk that risk assessors can then evaluate and take into account. In other words, risk communication could operate as an exchange between consumers and risk communicators/assessors, rather than as a one-way transmission of risk information from experts to consumers. This is even more so the case with emerging risks, where there is a lack of available evidence to “correct” consumers’ risk perceptions.